The top 20 students from our four heats will present in the final competition on Thursday, March 21, 2019 in the Wolf Performance Hall | London Public Library (Central branch) at 7:00 p.m. A reception for all 3MT participants and guests will follow where we announce our top three winners. 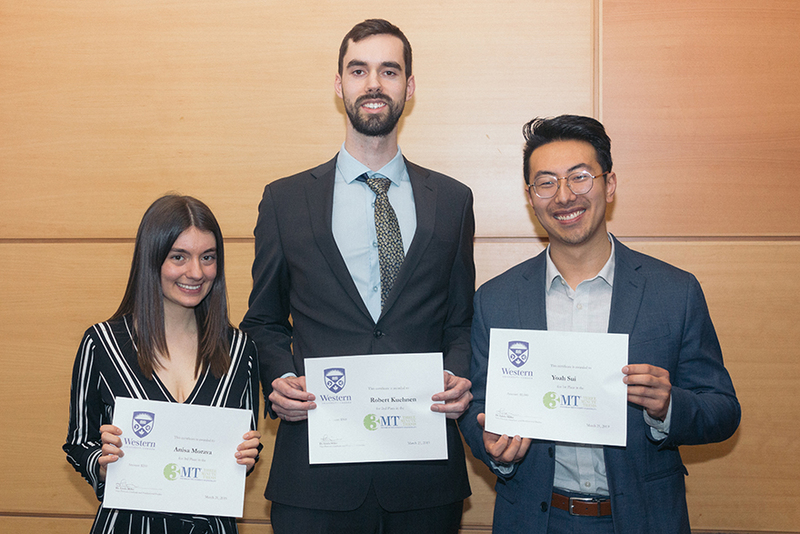 The first-place winner from Western's final will attend 3MT Ontario 2019 hosted at McMaster University on Wednesday, April 17, 2019 at 10:00 a.m.
3MT (Three Minute Thesis) is a research communication competition where graduate students have 3 minutes or less to present their research and its impact to a panel of non-specialist judges and peers. The exercise develops academic, presentation, and research communication skills and supports the development of research students' capacity to effectively explain their research in language appropriate to an intelligent but non-specialist audience. The competition was developed by The University of Queensland (UQ), Australia. The first 3MT was held at UQ in 2008 with 160 graduate students competing. Enthusiasm for the 3MT concept grew and its adoption in numerous universities led to the development of an international competition in 2010. Western University was one of the first Canadian universities to host a 3MT competition in April, 2012. This fun and challenging academic competition is an excellent opportunity for graduate students to improve their communication skills. Whether it be networking, a job application, research opportunity or scholarship application, the ability to effectively communicate complex research and its impact using open language is a valuable skill set. Heats will be hosted by each Faculty. Some faculties are grouped together based on historic participation rates. Please register under your corresponding Faculty. Registration will close one week before your faculty heat date listed below. There will be no exceptions for missed deadlines. Planning Guide: a detailed guide to help you plan your event. Name randomizer: a useful tool to create a random order for your faculty heat. Powerpoint slide template: note that all student slides MUST BE in 16:9 screen format. Alternative aspect ratios WILL NOT be accepted. Judging Sheet template: use up to 10 participants per page. For additional participants, click the tabs at the bottom of the excel file and print more pages. NOTE: Please also print this instructional COVER PAGE for your judges to go with the excel spreadsheet. This cover page gives important details to the judges so they know exactly what they are evaluating. Timer: a three-minute timer in mp4 video format. Right-click to "save as" to your local computer. Logo: the official 3MT logo to use wherever needed. VISIX 16x9 and VISIX 4x3: high-resolution images in png format for your program/department/faculty screens. Poster: a printable 8.5" x 11" poster to display in your departments. PhD and Master’s students who have defended but have not yet graduated are eligible to participate. Presenters must be available to present, in person, on the day of their heat, and must also be available to present, in person, at the 3MT final at the Wolf Performance Hall, London Public Library (Central branch) on Thursday, March 21, 2019. A single, static 16:9 PowerPoint slide is permitted (no slide transitions, animations or 'movement' of any description). No laser pointers are permitted. Presentations are to be spoken word (e.g. no poems, raps or songs) in English. Presentations are limited to three minutes maximum and competitors exceeding three minutes are disqualified; likewise, presentations that are significantly shorter than three minutes will be penalized. The decision of the adjudicating panel is final; scores are never disclosed to the participants. Prizes will be distributed at the 3MT Reception at the Wolf Performance Hall, London Public Library (Central branch) on Thursday, March 21, 2019. All participants are encouraged to attend the final and post-competition reception to celebrate the achievements of all presenters. Cash prizes are given to assist winners in attending conferences in order to promote their research and further their academic network. What will the room setup be like for presentations? Heats take place in rooms located across the university. Some rooms have a podium, but most participants prefer to stand and move around as they present. Microphones are generally not used for the heats. For the final, all participants will be wired with either a lapel microphone, or a headset-style microphone similar to the technology used for TED Talks. Am I allowed to use cue cards during my talk? Cue cards detract from the delivery of the 3MT and are not allowed. Please memorize your presentation. Will I be able to see my scores? Unfortunately, all scoring is confidential and not provided to participants. Many judges make comments on their judging sheets, and you can email your faculty coordinator to receive this feedback. Will my talk be videotaped? The 3MT finals will be photographed and videotaped; preliminary heats may or may not be photographed or videotaped based on the needs of each faculty. All 20 participant videos will be posted on Western's 3MT Youtube Channel for all to view. London's local television station, RogersTV, is also scheduled to videotape and broadcast the event. I submitted my slide for my faculty heat, but would like to make changes. Is this possible? Yes, it is possible to make changes BEFORE your faculty heat REGISTRATION DEADLINE, no later than ONE WEEK before your heat. In the confirmation email you received when registering, you can log back into the 3MT system and simply upload a new slide. The slide that will be used will be the slide you upload closest to your faculty heat deadline. Are there any opportunities to participate in a public speaking event prior to 3MT? Yes, the Western Research Forum is an annual event hosted by SOGS that traditionally takes places a few weeks prior to 3MT, with several opportunities to discuss your research in a public, non-specialist setting.